CONVENTIONAL wisdom, strongly promoted by the natural gas industry, is that natural gas drives down American emissions of carbon dioxide, by substituting for carbon-rich coal. The climate stabilization plan announced by the Obama administration on Monday relies on that. But in other ways, cheap natural gas drives emissions up. “It’s a seesaw,” said Michael W. Yackira, chairman of the Edison Electric Institute, the trade association of the investor-owned electric companies. Some of the factors are hard to quantify, making it uncertain whether, in the long term, natural gas’s net effect is positive for climate control. That part is easy to quantify. Coal generation peaked in 2007 at a little over two billion megawatt hours while in 2013 it dropped to 1.58 billion, according to the Energy Information Administration. (A megawatt-hour, or 1,000 kilowatt-hours, is the amount of electricity a typical suburban house uses in a month.) Over the same time, gas generation started at 857 million megawatt-hours and ended at 1.2 billion. If all the increase in gas-fired generation replaced coal, then the switch produced savings of 113.1 million tons of carbon a year. But natural gas is starting to replace nuclear power, which can be seen as wiping out about 10 percent of the savings, because a reactor has a carbon footprint of nearly zero. Last year the owners of five reactors announced they would retire them. Some had mechanical problems or political opposition; some did not. But all were challenged by the drop in prices on the wholesale market, driven down by natural gas. And several other reactors are losing money and could close this year. There are two other easy-to-see effects. The fracking for oil that has opened vast new supplies of gas is producing much of it in places where there is no pipeline. In those cases, the natural gas is burned off, or flared, because there is no way to ship it economically. According to the Energy Information Administration, last year the producers flared enough gas to have produced 27 million megawatt-hours. That pushed emissions up by 16.5 million tons, about 15 percent as much as the reduction in coal burning saved. And some of the natural gas escapes unburned. 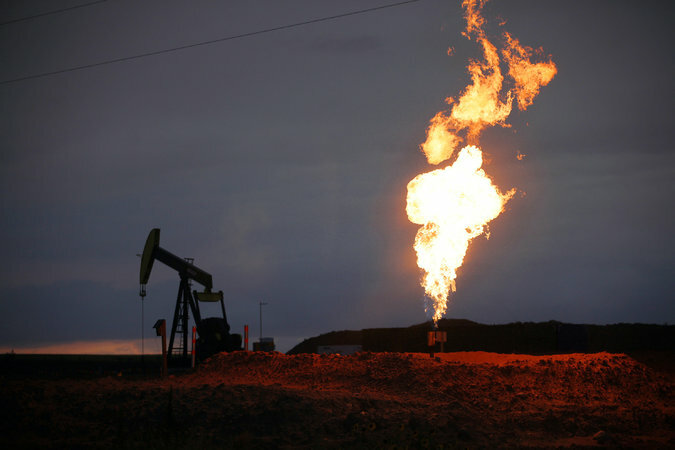 Its main component, methane, is a global warming gas and is far more powerful than carbon dioxide, although it does not persist quite as long in the atmosphere. Even before fracking became widespread, when natural gas was expensive to extract, there were emissions of methane. But from 2007 to 2013, the increase in gas consumption added methane with a carbon dioxide equivalent of about 19 million tons. That would wipe out another 17 percent of the savings from displacing coal. The number could be higher; some experts use a different formula to translate methane into a carbon dioxide equivalent. There are other less apparent effects, including stunting the development of zero-carbon generating stations. Natural gas is suppressing the development of new nuclear plants, experts say, leaving the country with an aging fleet of reactors. James L. Connaughton, an adviser to Constellation Energy when it was trying to build a third reactor at the Calvert Cliffs plant south of the District of Columbia, cites the collapse of natural gas prices in 2008 as part of the reason that the company abandoned that project and four more that were to follow. “Natural gas has made nuclear more challenging,” said Mr. Connaughton, who was also an environmental adviser to President George W. Bush. It is probably also reducing the growth of wind energy, many analysts said. Wind contributes only slightly to generation capacity needs, but whenever it runs, it saves fuel, mostly natural gas, and that gas is now worth about half of what it was a decade ago. He added, “Low natural gas prices decrease the benefit of energy-efficiency investments as well,” since the kilowatt-hours saved by installing a better air-conditioner or light bulb are worth less than they would have cost in a world with higher gas prices. Limiting carbon emissions will most likely mean resolving to leave cheap fossil fuels in the ground, he said. Almost nothing valuable is left undrilled or unmined, he said. “The history of leaving $100 bills buried in the ground is really a short one,” he said. And while cheap natural gas helps spur economic development, it has some collateral benefits that are harder to measure, energy experts said. Paul Bledsoe, a White House aide who specialized in climate during the Clinton administration and now is a senior fellow at the German Marshall Fund, said that low natural gas prices enabled the “the suite of emissions reductions across the board” at old coal plants, including mercury, fine particles and sulfur dioxide. Mr. Bledsoe said the low price was allowing the E.P.A. to push forward with rules limiting emissions of those conventional pollutants. Those rules have forced the retirement of many old coal plants, a step whose cost to the public is minimized by the availability of cheap natural gas as a substitute, he said; if natural gas cost today what it did in 2007, costs would be much higher and the E.P.A.’s ability to act would be much more limited. Noting that natural gas was squeezing out some zero-carbon energy sources, Mr. Kimmell of the Union of Concerned Scientists said, “It would be a tremendous mistake to rely upon natural gas” to solve the climate problem.